My latest pumpkin idea had me going in a simple cookie direction. It was between Pumpkin Sugar Cookies and Pumpkin Chocolate Chip Cookies so I reached out to my Facebook community to see which one I should make. It was unanimous...everyone wanted the sugar cookies! I'm not one to disappoint so I got to work using my basic sugar cookie recipe as a start. 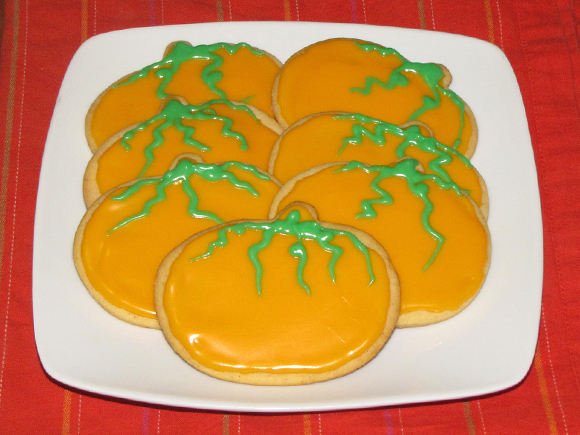 I added some pumpkin puree along with the spices and I had a light cookie with a hint of pumpkin flavor. I got the kid, the husband, and the mom approval on these so I think it's safe to say that this recipe is a winner. These are good by themselves but I decided to be a little more festive and decorate a few with icing. 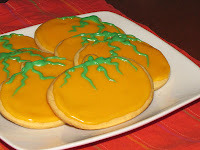 I adapted it a little, but the original icing recipe can be found here: http://allrecipes.com/recipe/sugar-cookie-icing/. The icing dried hard and shiny. 1. Cream butter and sugar together in large bowl. 2. Mix in eggs, pumpkin puree and vanilla. 4. Divide dough into two, wrap each in plastic wrap and chill for at least 1 hour or until firm. 6. Roll out dough onto floured surface to about 1/4" thick and cut into desired shapes or use cookie cutters. 7. Place on parchment-lined (or lightly sprayed, foil-lined) baking sheet and bake for 8-10 minutes or until golden brown. 8. Let cool completely before decorating. Icing recipe follows. 1. Place milk in bowl and add half the powdered sugar a little at a time until all is incorporated and smooth. 2. Add corn syrup then the rest of the powdered sugar. 3. Color with food coloring then decorate cookies. Depending on how many cookies you want to decorate, you may need to make a couple batches of the icing.